In 1946, Hollywood’s most famous swashbuckler, Errol Flynn, arrived in Jamaica in a storm-ravaged boat. After a long and celebrated career on the silver screen, Flynn spent the last years of his life on a small island off the Jamaican coast, where he fell in love with the people, the paradisiacal setting, and the privacy, and brought a touch of Tinseltown glamour to the West Indian community. Based on those years, The Pirate’s Daughter imagines an affair between the aging matinee star and Ida, a beautiful local girl. Flynn’s affections are unpredictable but that doesn’t stop Ida from dreaming of a life with him, especially after the birth of their daughter, May. 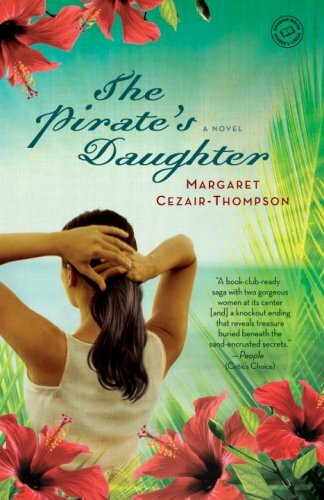 Margaret Cezair-Thompson weaves stories of mothers and daughters, fathers and lovers, country and kin, into this compelling, dual-generational coming-of-age tale of two women struggling to find their way in a nation wrestling with its own independence. I really enjoyed this story. Since I am quite familiar with Jamaica, my husband being Jamaican, I appreciated and understood the historical setting and of course, the patois spoken in the book. This book is now on its way to someone who chose it out of a virtual bookbox I am participating in. Enjoy!